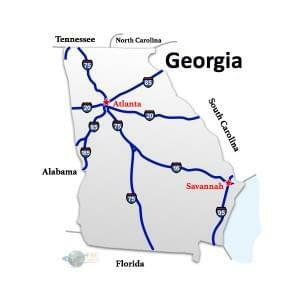 Georgia to North Dakota Freight shipping and trucking services are in high demand; Atlanta to Fargo is a very heavily traveled route. The Atlanta, GA to Fargo, ND freight shipping lane is a 1,364 mile haul that takes more than 20 hours of driving to complete. Shipping from Georgia to North Dakota ranges from a minimum of 1,402 miles and over 21 hours from on the road from Indian Springs, GA to Hackinson, ND, to over 2,086 miles and a minimum driving time of 31 hours on the road from St George, GA to Fortuna, ND. The shortest route from Georgia to North Dakota is along I-94 W; however, there’s also a more western route that uses the I-24 W, passing through Cedar Rapids, IA and St. Louis, MO. 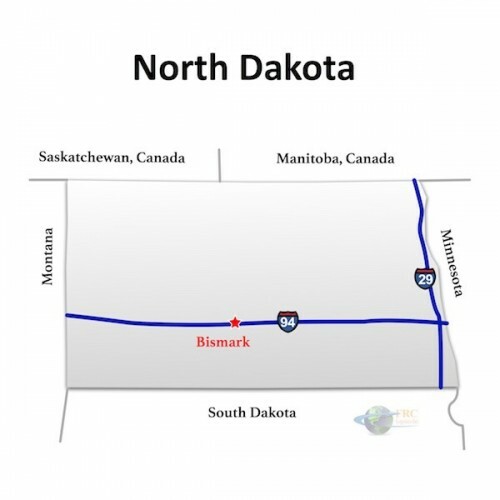 North Dakota is located at the heart of the continent and borders on Canada. Shipping from, through or to North Dakota is simple to plan using FRC Logistics’ online quote generator. Our unique and intuitive instant online tool can help you find accurate and timely prices whether you are shipping a full consignment, looking for an LTL deal or have a specialist item that needs to be moved through the upper Midwest. North Dakota is currently enjoying a boom in natural resources, primarily oil extraction, and has enjoyed the fastest-growing economy in the USA for the last five years. As well as the oil industry, agriculture, mineral extraction and food processing are key industries. The flat prairie land and climate are ideal for growing legumes, oilseeds and cereal crops. Machinery, particularly for use in mineral extraction and farming, is routinely transported along North Dakota’s road network. Georgia to North Dakota Freight shipping quotes and trucking rates vary at times due to the individual states industry needs. Since Georgia and North Dakota are mainly industrial, with many food processing and distribution centers, trucking rates will vary at times due to the individual states industry needs. We see plenty of shipments by refrigerated trailer, flatbed trailer as well as by the more common dry van trucks. Our Less Than Truckload (LTL) carriers in both Georgia and North Dakota are also running a number of regular services between the two states, and it’s an active route for heavy haul freight shipments, as well.